This worked perfectly in my Hawaiian-themed bedroom. Excellent quality - washes beautifully. This multi-colored floral quilt set would be perfect for a young girl's room. The quilt is available in Twin and Full sizes, and includes one sham in the Twin set and two shams in the Full. The entirely cotton bedding is machine washable. Aloha Multicolor Quilt is WONDERFUL!!! Prior to purchasing this quilt, I read the reviews and was worried that it would be too young for me (yes, I'm over 50)! However, it is just perfect. It is relaxing, with beautiful colors and provides just the calmness I was looking for my bedroom, with plenty of color! This is a beautiful quilt, made well and perfect for young and old alike. This quilt is beautiful and colorful. I bought the twin set and it came with The quilt and one sham. It is nice and wide, covering both sides of the bed very nicely. I am very pleased with this purchase. 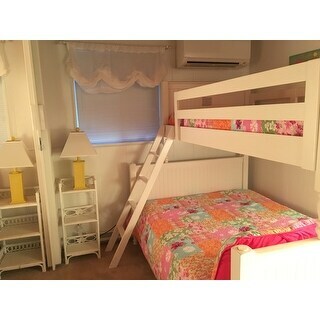 I bought a twin and queen set for my daughter's bunk beds. Love the quilt. It's not a quilt really, though. It's two pieces of fabric sewn together that have a patchwork appearance. The size is great for my daughter's queen bed and the colors and pattern are bright and beautiful. It looks just like it is advertised. I have not washed it yet, though, so we'll see how it fares, but I'm guessing it will do well. I am very pleased with this. I received this quilt set today and am thrilled that its colors are exactly as shown. It was surprisingly soft out of the package but had a faint new dye smell so I washed it and it came out just fine! The colors didn't fade or bleed even though the reverse is a dark pink. It seems to have a true full/queen fit. I am using it on my granddaughter's full size bed that has 12 inch thick mattress and boxsprings and it hangs nicely down the sides/bottom. The shams are well made and a queen size pillow might fit a little better than my standard sizes in them but they still look comfy! Great deal! OK, so had I been a better shopper I would have read the review that stated this already but I was THRILLED to receive this and find out that it wasn't a true quilt (i.e. a bazillion pieces of fabric sewn together). It is, as another reviewer stated two solid pieces of fabric (front and back) sewn together. The reason I'm LOVING that is because sometimes if quilts aren't sewn together by talented little old ladies the seams where the two pieces of fabric meet can fray and come apart...since this is one large piece of printed fabric (on the front) that cannot happen. All that excitement aside (I don't get out much so yes, that was the highlight of my day) the colors are AWESOME and very vibrant. My daughter is getting our old guest room which I am too lazy and unmotivated to repaint so we had to find something cool-girlish to tie the green in- this is perfect beyond my expectations. The size is perfect for a queen or full and I'm so anxious to see my daughter's face on her big New Bedroom Reveal Day. I would 100% recommend this product to anyone who has impeccable taste (snicker...like myself) and is looking for something girly without being too frilly. I saw this quilt last year and was waiting for it to be available again in the Twin Size. It just arrived today and it is not how it is pictured online. It is not a real quilt and is one piece of fabric with the images printed on and run through a machine to look like a quilt. The patches are a lot smaller than pictured making it look too busy. I got this for a light blue room, but there is not enough light blue squares and too many orange floral and plaid . Will be returning this product ASAP! This was such a pretty little comforter and pillow sham! Too bad there were no matching items available to order, like curtains or a valance. It's not a real quilt, but all one piece of fabric- but it is lovely anyway. The colors are exact, so there was no surprise when I opened the box. I love it! This wasn't bought for a little girl, but for me....67 yrs old. I think it makes my bedroom a very happy place. You can't look at this quilt set and not get a happy feeling. I love the size, and it drapes down the sides, like a bedspread. Very happy with this purchase. The reviews were helpful to me, also.....very positive. My daughter loves this quilt. Great quality. Beautiful patterns and perfect colors for any girls room. I bought this to decorate my mom (elderly) room. We wanted it bright and to remind her of when she served in the marines in Hawaii. The room came together perfectly and the quilt looked great. It does get washed frequently so there is some fading but it is wearing well. This is a beautiful quit. It is great feng-shui wise for our bedroom. I like fthe fact that it has a cotton, and not polyester, batting, making it more breathable so one doesn't overheat. I also like its fuschia backing, which makes the quilt reversible for when one is in the mood for a solid color. The shams are of the same cheerful fabric. The quilt is thin because the batting is thin, making it perfect for our hot climate. If you live in a cold climate, you will want a warm blanket underneath. And of course, the price is great too! In 2014, I bought 3 of these quilt sets for our beach house which has a large guest room that can be separated into two rooms by a divider. We rent our home for three months in the summer and I love to provide a bright, beautiful place for our guests to enjoy their vacations. These quilts have just the look that I wanted, and after 2-1/2 seasons, I can safely say that they have held up well and look as beautiful today as when I first received them. The attached pictures are from this June, so show the quilts after two years of use. I couldn't be happier with my choice! I bought this quilt in September of 2013. It is on my 3 year old's bed, and it looks adorable. The colors are just as pictured. This is a lightweight quilt, which is perfect for the Texas weather. Being on a toddler's bed, this quilt has been washed many times. It has held up great so far. I would definitely recommend. The colors in this are absolutely beautiful! My daughter loves it! Beautiful quilt! Perfect for a little (12 year old) girls room. Washed often and has held up to the washing and drying, stitching and color have lasted. The colors are just gorgeous in person. The quality of the bedding was also very nice. We loved it. Love this comforter! So cute and great quality. Great little set for my beach house spare room. Cheerful and fun they are looking great. "I am wondering how heavy this is, I am looking for a light weight summer quilt." Yes, this is a light weight quilt. "Does this quilt have any Lavender or purple tones in it, its really hard to tell?" To me there's a pale lavender color in it. I love it! I agree, there seems to be some pale lavender in it. I bought this item for bunk beds and the other bedspread I bought has a LOT of pale lavender (purplish cast) in it and this bedspread, believe it or not, was very compatible with it. It doesn't have lavender or purple in it...but because it has so many complimentary colors ....it blends right in. I also have lavender and purple in my room (bed room/studio/office) and it brightens up the whole room. "WOW Thanks for such a fast response! Why does the title indicate pieced when it is only 1 piece? I understand the back is fuschia... does it have a pattern or just plain? Thanks again!" The back is solid pink. I don't think its true patchwork. Its a nice little quilt, but like other reviewers said, fairly thin. Good to use with another layer underneath. But it is pretty! "Is this a true patchwork? Different patterns cut out of different fabrics and sewn together? By machine? I would think yes for the price. However its still a great price even if pieces are machine stitched. It's important to my clients tho. Is the back solid... understand it is pink or fuschia.. does it have a pattern to it? Thanks!" It is a print and a reviewer said the back side is fuschia. "Is this quilt reversible? If so, what is on the other side? Thank you!" It is "Hot Pink" on the other side. 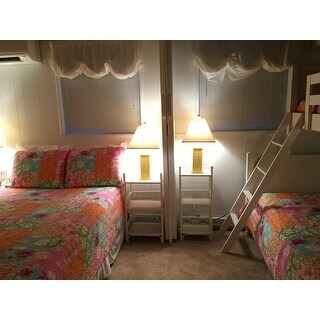 I just put it on the twin beds in my beach house and it looks good. The sham has the pink as the back. I wish it were longer on the sides, but all in all it's nice. Hello Kathy, this item is reversible with pink on the opposite side. Please feel free to contact us again with any further questions. Thank you for shopping with us! "When will this be available in twin size? I really want two of them in twin size!" Hello oneroompalace, items are restocked as they become available; however, we cannot guarantee an item will be restocked. Thank you for shopping with us. I got the twin size and have already washed it a few times. Held up ok. The fabric is a print of a quilt, not a true quilt. The underlay is quilted. The reverse side is solid pink. The sham is smaller than expected...perhaps it shrank in the wash. Got it for my day bed and would have liked two shams...probably should have ordered double to get two shams. Feels soft after the first wash and sizing removed. Survived dryer ok. Over all happy with product. Very cherry color combo. Quilt Buying Guide from Overstock.com. Our guides provide customers with information about buying quilts. The covering you put on your bed can affect the style of your bedroom as well as your comfort when you're sleeping. Read on to see whether a bedspread or comforter is the perfect choice for your bed. Your parents probably had the best bed in the house when you were a kid. Now that it’s time to graduate to that same elevated look for your bedding, make sure you have these seven bedding essentials. It only takes a few simple items and a little coordination to dress your bed properly. Whether you prefer a casual, lived-in look or a crisp hotel-style bed, learn what bedding essentials you need to layer your bed like an adult.